nothing like a daughter's love. | escaped. nothing like a daughter's love. Had a long good talk with mum last night. I waited till evening to message her cause I know by then everything would settle down, and I was still at lab working on my presentation slides so I took some time in between breaks to message her. Then she called. Her voice was solemn and calm; even though there were signs that she had been crying. She told me everything is fine, everything went smoothly and that I needn't worry about anything. She asked me how I was, so I told her how I feel like everything I do isn't enough for Atok. I've read Quran and Yasin but being far away, this is all I can do. "I know you're upset not being able to be here, but Atok knew you wanted to. Atok loves you so much, and she understands you couldn't come home. She knew you love her too. She forgave everyone, and she looked so peaceful. We've done everything we could, we brought her to the best doctor, the best hospital, but God loves her more, and there's nothing more we can do except being strong and always pray for her. I'm very thankful that Atok brought you girls up so well, I'd always remember what she has done for me and for us. We have to accept qada' and qadar. She's in better place now, so always remember that." She cried, but she said those words in her strongest self, I could tell. This is coming from a woman who cried like a baby when Atok first went for haji a few years ago. I'm still sad, but listening to my mum makes me feel so small. This must've been so hard on her since she's closest to Atok especially since Dad was gone, they spent so much time together - but she managed to get herself together and comforted me. I'm so proud of her I can't say. I wish I'm half a woman she is. She got the privilege of choosing the place my Atok would be laid to rest, and she chose a spot right beside my Dad's. All I can think of right now is how much I want to go back and visit the graves. Up till today, I'm getting better especially after the talk with mum. 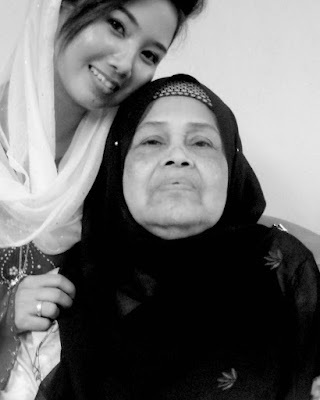 I know that we all have to be strong, and even though Atok is gone now she will always be remembered in our prayers. I'll always miss you, Atok. I love you, always have and always will. As HE promise HE will always be there." - Maher Zain, Always Be There. OMG!!! This is such an emotional and touchy post. After reading this I cant stop tears coming to my eyes. Thanks for sharing. Al-Fatihah to your both : Grandma and Dad . SubhanAllah you're strong. Death is part of life and even though it hurts so much we all have to go through it. May Allah (swt) make it easy for you. You might have to subscribe again. Sorry for the inconvenience! @sarah munir : thank youu uted. insyaAllah. @love and sugar : insyaAllah I'm trying my best. yea after all everything has hikmah behind it, we have to accept qada' and qadar. I believe so. truth is, i couldnt help but to cry reading this because i when through the same turbulence when dealing with my Pak Nek's lost. Mama didnt have the heart to tell me because i was facing my PHD entrance exam. By hook or by crook it just wasnt possible for me to take the next flight back, event if i persisted, my parents wont allow it. my Bapak told me everyone was there so its okay, he told me they will settle everything and i should just think of my exam and gakkais. i actually called home everyday when i knew my Paknek was admitted to the hospital, I skyped with him, he told me to just study baik2 in the most fragile voice ever and knowing that he was talking at his best and smiling i denied the fact that he was critical and swept my worries away by telling him hes gonna be ok. i dont know how i did that, my bapak was like, cant you see Pak Nek is lemah? Im like naa skay hes gonna be okay... and two days later... I called Bapak again, that was when bapak told me you should speak to Paknek, he can listen to you, he knows... and my heart stopped. I couldnt breath, literally fell on my knees and i screamed in the phone. It still gets to me that all i could say was im sorry. the only word i could tell my Pak Nek is my last salam to him and im sorry. I couldnt even say i love you. that night he passed. Bapak was suppose to pull his plug the next morning, but he died a natural death that very night. and the next week, I sat for my PHD entrance test. this is one thing i will never forget. im writing this, i cried reminiscing. i am not a yassin reader, you know how i am hahaha... that moment i was so desperate that yassin felt so short and i just re read it until i slept. your desperation i can feel it. I pray both your Atok and my Pak Nek are in Allah's mercy and love. Amin. Didi, thank you for this lovely comment :) I can't help but cry too when I read your comment, cause it must've been tough for you when you were having your phd exam. For me, it was near my chukan happyou but at least it wasn't an exam. But I'm so proud of you for being so strong. I went through the same denial phase too, kept telling myself and assuring my mum saying Atok will be ok..but a few days after that, she was gone. I think we can't help but need some reassuring cause we were so far away from them that we kept telling ourselves that. I didn't even get to talk to Atok during her final days cause I was so busy with lab I always went home late that I didn't want to bother her at night, but it was no excuse, I know. But I kept thinking that I just can't take hearing her fragile voice or I would really break down and that feeling of not being able to be there would kill me. That being said, now and then when I read this post I'd remember how much I love her and I still miss her, but I'd always remember she's in a good place now. They both are. InsyaAllah they'll be in Allah's mercy and love, amin.